We all know feature creep can be a problem in almost any project. A simple idea can often become unusable if a project’s scope isn’t clearly defined in the beginning. However, the opposite problem sometimes presents itself: forgetting to include a key feature. [Zach] had this problem when he built a Raspberry Pi magic mirror and forgot to build a physical reset/shutoff switch. Luckily he had a spare Amazon Dash button and re-purposed it for use with his Pi. The Raspberry Pi doesn’t include its own on/off switch. Without installing one yourself, the only way to turn off the device (without access to the terminal) is to unplug it, which can easily corrupt data on the SD card. Since [Zach]’s mirror was already complete, he didn’t want to take the entire thing apart just to install a button. There’s already a whole host of applications for the Dash button, so with a little Node.js work on the Raspberry Pi he was able to configure a remote-reset button for his mirror. This is a similar problem for most Raspberry Pi owners, so if you want to follow [Zach]’s work he has done a great job detailing his process on his project site. If you’re looking for other uses for these convenient network-enabled buttons, he also links to a Github site with lots of other projects. This pizza button is probably our favorite, though. The once successful Kickstarter and National Science Foundation (NSF) research grant winner Electroloom is saying “Thanks and Farewell” to its backers, supporters, and sponsors. The startup ran out of funding while developing printer-like machine that uses electrospinning to automatedly produce ready-to-use garments. Electroloom has been an ambitious project to explore if electrospinning could be made viable for garment manufacturing. The process that uses a high voltage to transform a resinous liquid into non-woven fabric was originally invented for textile fabrication, although its low throughput has always been a limiting factor. The method was mostly used in laboratory and medical applications. In 2014, Electroloom began developing a process that would bring the technology back to its fibrous roots, building an amazing prototype machine that could print an entire shirt in one piece. Electroloom’s Kickstarter campaign was funded in 2015, and earlier this year, an NSF research grant was awarded to the startup. The Raspberry Pi and other similar Linux-based single board computers simplify many projects. However, one issue with Linux is that it doesn’t like being turned off abruptly. Things have gotten better, and you can certainly configure things to minimize the risk, but–in general–shutting a Linux system down while it is running will eventually lead to file system corruption. If your project has an interface, you can always provide a shutdown option, but that doesn’t help if your application is headless. You can provide a shutdown button, but that leaves the problem of turning the device back on. [Ivan] solved this problem with–what else–an Arduino (see the video below). Simplistically, the Arduino reads a button and uses a FET to turn off the power to the Pi. The reason for the Arduino, is that the tiny processor (which draws less than a Pi and doesn’t mind being shut down abruptly) can log into the Pi and properly shut it down. The real advantage, though, is that you could use other Arduino inputs to determine when to turn the Pi on and off. With all of the cool features on the Raspberry Pi, it is somewhat notable that it lacks a power button. In a simple setup, the only way to cut power to the tiny computer is to physically remove the power cord. [Dalton63841] found that this was below his wife’s tolerance level for electronics, and built a simple remote control for his Raspberry Pi. [Dalton63841] started this project by trying to use the UART TX pin, but this turned out to be a dead-end. 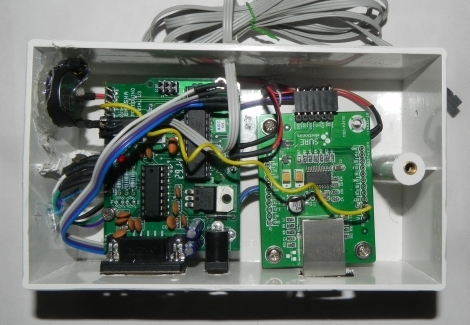 He decided instead to use an Arduino to monitor the 3.3V power rail on the Pi. When the Pi is shut down in software, the Arduino can sense that the Pi isn’t on any more and disconnect the power. The remote control is used to turn the Pi on. The Arduino reads the IR code from a remote and simply powers up the Pi. This is a very simple and elegant solution that requires absolutely no software to be installed on the Raspberry Pi. We know that this isn’t the most technically complex project we’ve ever featured, but it is a good beginner project for anyone just getting started with a Pi, Arduino, or using IR. Plus, this could be the perfect thing to pair up with a battery-backup Raspberry Pi shutdown device that allows it to power itself down in a controlled way when a power outage is sensed. [Ishan Karve] works in some bizarro world where the building management demands that all servers and Uninterruptible Power Supplies be shut down at the end of each evening. While inconceivable to most systems admins, he has no recourse but to comply. This means that his employees need to turn things off before they leave for the day, and since they often work up to 15 hours a day, waiting for Windows server to shut down seems like an eternity. Being the good manager he is, [Ishan] decided to build a device that handles the clean shutdown of their servers and UPS for them. An Arduino board serves as the brains of the device, communicating with and issuing shutdown commands to the UPS over a serial port. The Arduino is also connected to the office network, enabling it to send ARP requests to the servers in order to determine when they have completely shut down for the day. In order to protect against an accidental shutdown due to network connectivity issues, [Ishan] added an RTC module to the mix so that the Arduino does not issue shutdown commands until at least 8 pm. Instead of waiting around for Windows to do its thing, [Ishan’s] employees can take off once they start the server shutdown process, knowing that they are totally compliant with their landlord’s crazy requests.